Home » Biology , Carbon , Human Body » How much of the human body is carbon? Q. How much of the human body is made of carbon? What percentage of a human is carbon? 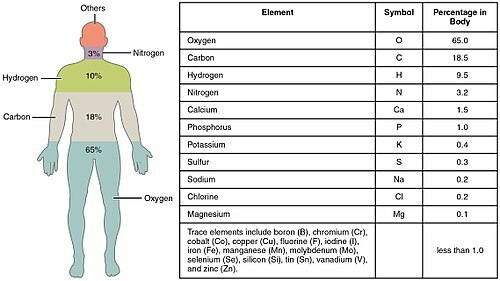 Roughly 96 percent of the mass of the human body is made up of just four elements: oxygen, carbon, hydrogen and nitrogen, with a lot of that in the form of water. The remaining 4 percent is a sparse sampling of the periodic table of elements. Why do we need the carbon? Carbon helps with cellular respiration by which your body releases energy stored in glucose and the glucose compound is composed of carbon, hydrogen, and oxygen.Carbon makes up 18% of the human body. Sugars in the body like glucose hold carbon elements. And carbon is ingested into the body by eating carbohydrates. Thanks for reading How much of the human body is carbon?